Recently, I learned about yet another wild & crazy art project on Facebook. This one is an art contest sponsored by Sell My Art! I'm sure you know how many art contests are out there, and most of them charge a hefty fee to enter. This one, however, was free. Lots of art contests have no prizes at all, but this one did. In fact, while the value of the prizes - a customized fan page and some social media and marketing training - seems a bit inflated to me, they are potentially quite valuable. What's not to like? I figured even if I lost, I'd still gain some good exposure for my work. I'm usually not a competitive person, but this contest spoke to me, and I decided to enter. I picked the painting that's been getting the most favorable comments from other artists, as well as from gallerists and art consultants who've seen it. I went to the contest's fan page and found it easy to enter, as promised. Now that I'm in, I really want to win. Why not? My art compares favorably to the other entries. Goodness knows, since founding Artists Alive & Well, I've developed a heck of a network. I shouldn't have any trouble drumming up votes. Plus, you can vote once a day. Some of my more loyal supporters might actually?be willing to do that. I also wanted this experience to be fun, so I set up my participation in the contest as a game and invited?pretty much everyone I know, especially my Facebook friends, to play along. I'm sending out lots of messages encouraging them to vote for me. Please play the WIN the Sell My Art? Contest game with me! What's in it for YOU? - If YOU? -? If I win, I promise to blog about as many of?the great social media and marketing strategies I learn via the contest?prizes as I can without violating copyright. Vote soon and often - even daily (You'll be at your computer messing with emails anyway, right?? :-) ) - and invite all your friends and family to vote! UPDATE: I just learned that the top entry has more than 100 votes, and there are 10 in contention for the top 3 prizes. I'm about #22 on the page of MOST VOTES, but I don't know if that's an accurate reflection of my overall ranking. ?I'm sure I'm well within reach of one of those prizes - with a little help from you! Besides, who's more hard-working and deserving than MOI?!? So please DO vote for me every chance you get between now and 9/24 - and share this message with all your friends and family! That's the message about voting for my artwork in the contest - NOW, here's the message for you: Don't be shy about entering contests or participating in auctions or other events that can serve as?useful tools for promoting your art. Even if not much of your art gets seen during such events, it could be seen by a lot of people. I have no idea how many?folks will see my art as a direct result of the contest. But I'm sure hundreds will have a chance to see one of my creations because of all the drum-beating I'm doing to get people to vote for me. Of course, do your homework. If there's a fee or if you have to ship your artwork off to Timbuktu (not recommended! ), you'll have to decide whether it's worth it. ?But if you can enter and make your participation fun, as I'm doing with the Sell My Art! contest, I'd say go for it. The art collector or gallery owner you've been waiting for just might see your promotion for the event and get in touch. My Art Is in a Show in FRANCE! Here's how it happened: I saw an online request for postcard-sized art for an exhibit in a restaurant in Rouen, France (actually in a nearby town with a long name). OK, the restaurant is in a JAIL, the exhibit organizer said, but what the heck. Hopefully, it's in a former jail. Regardless, how else am I going to get myself in an art show in FRANCE... for free... at this stage in my career?!?! I immediately decided to enter. Why? More on that later. Since the venue is a restaurant, they asked for food-related art. 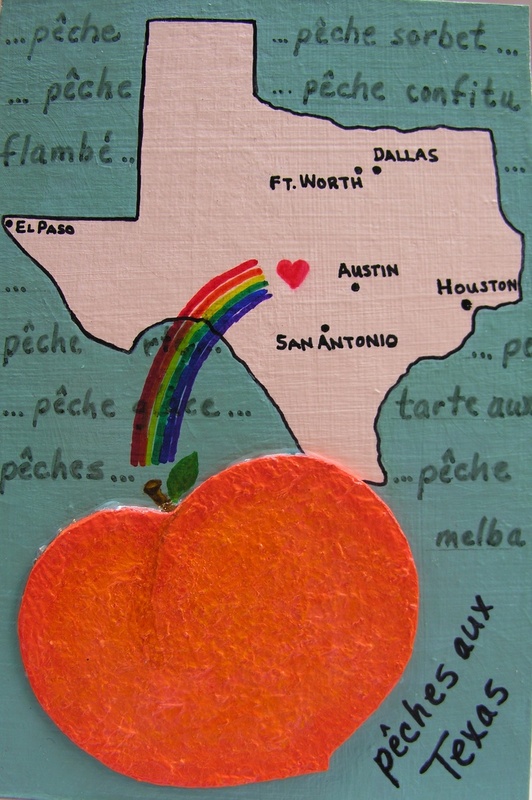 I chose the Texas peach as my theme. Easier to draw than barbeque, right? I also decided to make my piece look as much like an old-fashioned postcard as I could. I painted, I glued, I textured, I shipped it off and – VOILA! – now my art is on display in France. After the exhibit ends, it will be added to the restaurant's PERMANENT collection. Lah-di-da, s'il vous plait! Why did I bother? : I won't get paid for this piece of art. As far as I know, the works aren't even for sale. I just donated my little painting to the restaurant's "permanent collection." And even while it's on display, it's in France for pity's sake, thousands of miles away from where I know a single solitary art collector. Why did I bother? First of all, for the fun of it. Period. I succeeded at that. Second, this was a challenge to my creativity, although a small one. Nevertheless, I wanted to see if I could create something that would embody the theme, be fun to create, and be different (in a good way!) from the pieces already showing up on the Facebook page for the exhibit. I feel like I succeeded at that goal too. Third, I wanted to be able to say I'd been in an art exhibit in France! What better conversation starter for an artist that saying you have work in an art show and a private collection in France. That aspect has been a success too. I've emailed friends, written about the show on Faceboook, and talked about it at one of my networking groups. And the story gets a smile or a laugh - and a lot of genuine "Congratulations," "Atta girl," and "Go for it!" comments. Finally, it'll look great on my resume. WHAT? This tiny little piece of art in this tiny little show? YES. Anything creative I do is fodder for my resume. The next time I update my bio, this exhibit will definitely be included. Furthermore, if I can't get some publicity for doing this, I'm just not trying. Already it's given me fodder for my blog! The next media release I send out... you guessed it. The "Diner a la c'art" show will either be the theme of my PR, or it'll be prominently mentioned in the release. Why do you need to know about this? : As an artist, I encourage you to expand your horizons as I have. What do you consider legitimate outlets for your art? What kinds of exhibits or contests are you willing to enter? Unless you're selling your every creation for top dollar, those less prestigious outlets might open the door to some new opportunity or at the very least add to your resume in an interesting way. When was the last time you created a silly, frivolous or "small" piece just for the fun of it? When was the last time you deliberately gave up the notion of creating "great" art or even saleable art - and created something just because you wanted to? If your art isn't fun or if you're not creating something just for your own satisfaction at least part of the time, you're missing one of the best possibilities - if not THE best - of your art career. When was the last time you took on a creative challenge, even a small one, that took you outside your usual style or genre or image of yourself as an artist? Again, if you don't to that once in a while, you're limiting your potential growth as an artist. After all, if I can make peach fuzz out of dryer lint, who knows what I'm capable of creatively! When was the last time you had your art on display in France? If you're a regular on the French art scene, more power to you. If not, why not try the unusual, the outrageous, the downright playful to get your foot in the door. Despite my summer cold, the art shows must go on. I'm thrilled to announce two new exhibits featuring small but talented groups of Artists Alive & Well members. Houston's hottest emerging artists heat up City Centre with their colorful art. Location: Sculptures by Design, 12848 Queensbury Lane, Suite 204, Houston, TX 77024. Located at I-10 and Beltway 8 (Sam Houston Tollway) in City Centre, just north of Town & Country Village, upstairs above Eddie V's and across the street from McCormick & Schmick's. On-street parking available; garage parking in the building at Queensbury and the Beltway. Artists: James Adams, Linda Askin, Daniel Brents, Suzanne Buckland, Sandi Gardner, Margo I. Green, Valerie Gudell, Marilyn Balke-Lowry, Melinda Patrick, Linda Summers Posey and Sally Stubbs. Artists Alive & Well presents the cool blue moods of today's hottest emerging artists. Opening: Monday, October 4, 2010, 7-10PM. Happy hour prices all evening. Running throughout the month of October. Location: Max's Wine Dive, 3720 Washington Ave. (at Shepherd), Houston, TX. On-street parking available; small lot behind the strip center. Artists: Daniel Brents, Margo I. Green, Marilyn Balke-Lowry, Melinda Patrick, Linda Summers Posey and Sally Stubbs. Because the shows run back-to-back, I decided to link the themes with color – so each show will feature a distinct palette, red for Sculptures by Design and blue for Max’s Wine Dive. Two of the artists, Daniel Brents and I, even have thematically linked paintings in each show. Daniel is showing two halves of a diptych, one in each show, along with other works. One of my pieces in each show is from my "Self-Expressed" series. Come to either show and you’ll have the fun of seeing some great art – come to both and you’ll see how distinctly color can influence our work and our view of the world. Artists, see what you can do to make the themes of your shows reflect your creativity in a new way. The blog has been on vacation while I recovered from a cold and managed the process of pulling two small group art exhibits together (while trying to finish my artwork for both those exhibits and a couple of other upcoming art events). Feeling a bit overwhelmed by all this, I let myself get sleep-deprived, and the next unfriendly virus that came along found me an inviting target. The lesson here is: No matter how tight my schedule, I have to find time to take care of myself. That should be my first priority. Get enough rest, eat right, get some exercise and an occasional massage. There's no substitute for these essentials, and they ARE essentials, not just "nice-to-have" options. Lesson learned, for now. And I'll probably have to nudge myself again - and again. It's an easy lesson to forget when you're doing what you love. Meanwhile the shows must go on! See the next blog entry for details about these exciting exhibits. Suddenly, my art career seems to be booming... I'm in an exhibit that runs through August 20, when the closing reception will be held (see Upcoming Events, in the right-hand column). Then, I'll be in another exhibit opening on September 9 and running through the end of the month, followed by another one opening on October 4 for the month of October. Life is good! Don't be shy. Speak up, speak out. Let people know who you are and what you do - and why you're good enough at it that they should take a look at your work. I landed "Exhibit A" primarily because I introduced myself to the organizer of an art show I attended, told her what I did and expressed interest in her venue. Follow up and follow through. Those great contacts you meet at an art opening or networking event will turn into a meaningless pile of business cards in a flash - if you don't follow up with an email or a call. Yes, I sent that "Exhibit A" contact a note. It turned out that she was eager to find new artists. Don't drop the ball. If someone responds to your message, the ball is in your court. If they don't respond, the ball is in your court. Either way, keep following up - nicely, politely, professionally. Don't assume they're not interested because you haven't heard from them. After several unanswered emails and phone messages, I simply dropped by to see the contact for "Exhibit B." By that time the person responsible for art exhibits at this venue had changed. But I didn't drop the ball. Another round of messages, followed by another drop-in visit, and I had a show booked. In today's art world, a little courage and a lot of persistence can be as important as talent and connections. P.S. I'll be posting all the details for these new exhibits soon. You can trust me not to drop the ball on that! Artists are free spirits, weirdos or complete nutcases, depending on who you talk to. And we’re proud of it. We’re the outrageous innovators, breaking patterns in the interest of freedom, full self-expression and the First Amendment. Anything resembling stick-in-the-mud regimentation makes us break out in a cold sweat. When you’re in your studio creating, give that free spirit free rein. Otherwise, you’ll never grow as an artist. When you’re out in the world communicating with potential customers, you might want to rein that outrageousness in a tad. But only if you want to appeal to ALL your potential customers. Those who dig your outrageousness and want to see more. Those who fear your outrageousness and want to tame it. Whether your art is straightforward representational or off-the-wall abstract, you’ll find art enthusiasts who like your style in both these categories. It’s not like you have to paint something wild and crazy for one group and something tame and boring for the other. Paint (or sculpt, etc.) what you want and how you want. But like it or not, your best chance of succeeding as an artist lies in relating to both these kinds of folks. Learn to describe your art in terms anyone can relate to. Don’t go overboard with art school lingo. Who are you trying to impress, your art school professor? When showing your work, your goal isn’t getting an A in Painting 101 – it’s to help that potential customer understand your work enough to want it desperately. Resist getting carried away with your own personal interpretations of your work. It can actually be fun to listen to how viewers respond to your art and to engage in conversation about the varieties of meaning that can be attached to your work. Relating to your prospective patron like that will smooth the way to more sales. Above all, don’t get defensive about your art. If someone criticizes one or all of your pieces, you must take it in stride, at least when you’re out in public. Temper tantrums are for two-year-olds. Rising above a self-appointed critic’s worst is the best revenge. Being all that you can be as an artist means becoming as free and fully self-expressed as you possibly can. It also means being both the outrageous creator and the sophisticated professional when the time is right. Every arts organization should have a Suzanne Buckland. Suzanne is an artist and a correspondent for www.examiner.com. Not long ago, she profiled me and my arts organization, Artists Alive & Well, in her regular Houston Art Examiner column. That article came out in March. Suzanne has been covering Artists Alive & Well (AAW) ever since. She publishes our meeting announcements, calls for entries and invitations for our art exhibits, and other event notices. She even publishes a summary of each monthly meeting she attends. Soon after she interviewed me back in March, Suzanne joined Artists Alive & Well and she has entered several of our exhibits. So she has a vested interest in promoting our activities. Every time she writes about AAW, she attracts more readers for her column. Now that she’s exhibiting with us, her pieces about our shows help her attract more followers for her own art. Suzanne is the ideal PR contact for Artists Alive & Well. As an artist, she’s part of our target audience. This gives me an added sense of confidence that she’ll cover our events positively and accurately. She’s also an art enthusiast – she loves writing about and promoting her fellow artists. This is reflected in her enthusiasm for writing about our group. She just did a piece on AAW member Melinda Patrick and extended an open invitation to our members to contact her about their art activities. She writes for a local media source – so her articles are primarily of interest to Houstonians – which is perfect because that’s where Artists Alive & Well meetings and exhibits are held. You couldn’t do better than that. Look for media outlets that reach your target audience; look for writers and reporters who share an enthusiasm for your subject or at least an ability to write about it with enthusiasm; and if you find a reporter who’s IN your target audience, consider that a bonus. Or, if you’re in Houston, you can simply join Artists Alive & Well, and Suzanne will probably be covering your art career before you know it. Yesterday, I attended Sandy Lawrence’s Bistro Collaborative along with at least 12 other people including: Marian Smith – marketing veteran; Kumar Kandasami – software developer; Tanya Robertson – makeup artist; Jerry Scribner – real estate investor and wealth guru; Charles Bigham – social media consultant; Vannessa Wade – PR consultant; Janet Braun – financial advisor; Danielle Forget – author; Katrina Burkhalter – virtual assistant; Wes – insurance agent; and of course, Sandy Lawrence – founder of the DIY Marketing Boot Camp. The range of professions, interests and expertise these individuals represent is amazing. It’s such a pleasure to experience the flow of ideas, energy and genuine eagerness to help. With this amount of talent in the room, brainstorming never had it so good. Every time we meet, every attendee goes away with new ideas, new contacts, new resources and new inspiration they can use immediately to boost their businesses and projects. Artists – This type of group may sound like it’s just for business people. Not so. Like it or not, as an artist, you’re a businessperson. The input of other business people can infuse your art enterprise with the reality of discovering your target audience and marketing your artwork effectively. An informal free or low-cost setting. Sandy’s group meets in the coffee shop at a Kroger’s store. 5-10 dynamic, caring business people. Although you could create an effective network of just artists, you’ll enjoy the synergy of brainstorming with a variety of people. At least a handful of regular attendees will keep the momentum going. A volunteer to communicate with the group – to remind members about the meetings, at least until everyone gets used to putting them on their calendars. Someone willing to facilitate the group – to keep meetings focused on the task at hand, to prevent any one individual from monopolizing the group’s time, and to be sure everyone gets a chance to share what they do and how they’d like the group to help them. You’re invited to the next meeting of the Bistro Collaborative, Monday, August 23, 11AM-1PM, coffee shop, upstairs in Kroger’s, Westpark at Buffalo Speedway, Houston. If you’re in a great brainstorming or networking group, please share your suggestions and results in a comment. Seeking Honor, Respect and Love? Find Them Here! If you want to be worthy of honor, Aristotle seems to say, you must believe that you deserve honor. If you want to earn respect, according to Lao-Tzu, you must know that you are good enough exactly as you are, and you must be yourself without comparison to others. The same applies to your work – it is what it is, YOUR unique creation, and it can't and shouldn't be compared to anyone else's. If you want to be worthy of love, the best place to start is by loving yourself. No one deserves your love more than YOU do. When you clearly, authentically find yourself worthy of love, respect, honor, you’ll act like it. That will go a long way toward attracting others who also find you honorable, respect-worthy and lovable. While those others are catching up with you, you won’t be sitting around waiting – you’ll be creating the art you were meant to create. Couldn’t have said it better myself. Whatever your calling in life, respect yourself, honor yourself and love yourself enough to create the life you deserve. If you want an art CAREER, as opposed to an art hobby, you need people who love your art enough to buy it. Before these people can buy your art, they have to know it – and you – exist. You can paint 24/7 to cultivate your talent; you can meditate every day to tap into your muse. But for attracting actual paying customers, I haven't thought of a method that doesn't involve taking action in the real world outside your studio. Assertiveness – Not aggressive – assertive. The Houston Chronicle article about my work (see yesterday’s blog) didn't appear by magic. First, I wrote a media release and sent it out. Then I followed up with an email, a phone call, another phone call, etc., until the section manager assigned the story to a reporter. Then the reporter and I played telephone tag for days, until we scheduled the interview. At any point, if I'd said to myself, "Well, they probably aren't interested in my story anyway," the article wouldn't have happened. Consistency – Stay in regular communication with your future art collectors. This might mean starting a blog (as I've done! ), becoming active on Facebook, creating a newsletter – whatever works for you and your schedule. Most of all, develop a PLAN for your communication. An occasional random Tweet or newsletter won't give you the consistent visibility you need. Of course, share your accomplishments (landing a solo exhibit, winning an award or a big commission, etc.). But don't just sell. Write about things that will intrigue your potential collectors – your art techniques, creative process or sources of inspiration. Keep the communication flowing to keep your target market captivated. "Oh my goodness, thank you SO much for taking the time to write. I appreciate it...and have shared it with my editors." Her enthusiasm tells me that not too many people she writes about bother to thank her – and that my simple note might help her career as much as her article might help mine. How cool is that? ACTing to expand your art career isn't always easy or convenient, but it is essential. Your career won't see any action unless YOU act first.